ONLY 75 spots for Dimensie members, so don't waste any time! Dimensie-Members need to sign up here to join the prom this year! You can only sign up yourself and one additional person that isn't a member of Dimensie! You don't have to pay as soon as you sign up, collections will be made at a late point in time. The price will be 35€ max. and depending on our expenses, we might be able to lower the price a little bit. 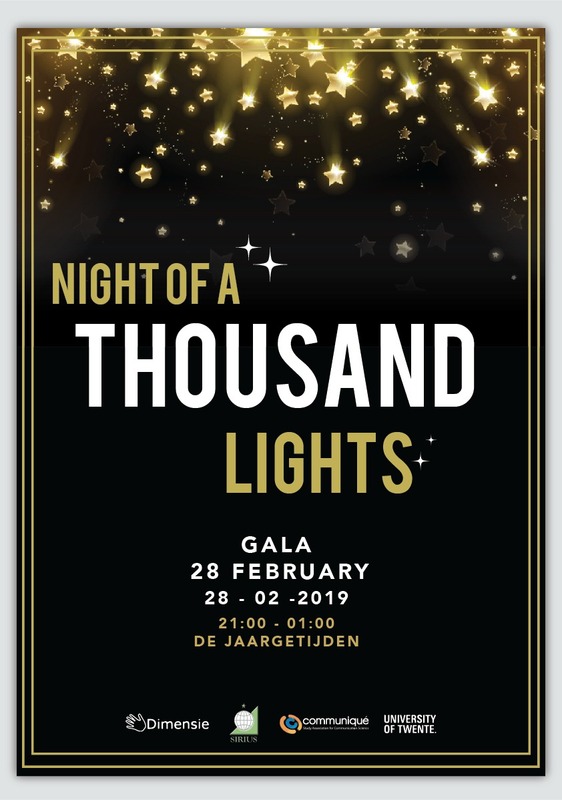 It's that time of the year again where we are getting ready for our annual Gala organised by Communique, Dimensie & Sirius. This year’s theme will be: Night of 1000 Lights. Prepare and go on the hunt in your closet for your dusty prom dress or your long-lost tuxedo. This is the chance to shine and dance the night away with all your friends from our study associations. Tickets will be available from the 16th of January 2019 on. Sign up to buy your ticket via the website of your study association. Be quick, because there are limited amount of tickets per association! We can't wait for this to be an unforgettable night! Don't forget to spread the news and join this event so you can be the first to get your tickets. And if you February is too long for you to wait here's a link to the Pre-Prom Party organised by Communiqué‘s Party Committee.